The Houses, Montague and Capulet, alike in dignity hence roses hate. An Iris not remains but Juliet who escaped her family’s sanguinary fate. The tyrant’s heir, a lad named Romeo. The lady Capulet, whose vengeance sworn, they meet where cheap and wiser not to go. And thus their star-crossed love was bred and born. But fate, whose heart beat fast for tragic stern, would suffer not their love to sail to port. The last, doth learn, that love is not enough. Twixt siller and crouptious they cavort. How find you then your bliss, with celestial foe? This solitaire does not predict, no. 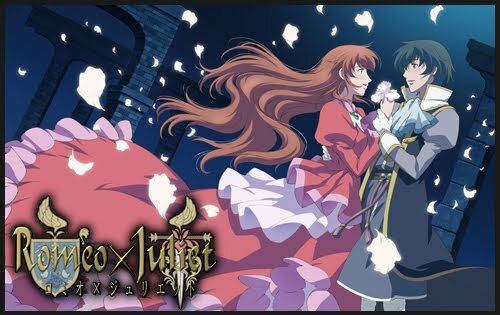 Romeo X Juliet is a Fantasy/Romance anime based on the play by William Shakespeare back during Elizabethan England. The 24 episode anime comes to us from Studio Gonzo (Last Exile, The Count of Monte Cristo) and was directed by Fumitoshi Oizaki. It originally aired from April to September 2007, with FUNimation as the current American Licensor. A manga adaptation written by the same writer as the series, Reiko Yoshida, was released in 2007 and finished in 2009. Yen Press holds licensing rights. Fourteen years ago in the floating island of Neo Verona, Leontes Montague and his men led a bloody coup and murdered all of the members of House Capulet, the rulers of Neo Verona. However one survivor, Juliet, was able to escape thanks to a group of Capulet loyalists. Fourteen years later, Leontes, the new Prince of Neo Verona, rules the land with an iron fist and crushes anyone who opposes him. Juliet, now a sixteen year old girl, fights against House Montague's oppression by becoming a masked vigilante known as "The Red Whirlwind". While attending a ball with a friend, Juliet meets Romeo, Prince Montague's son and both of them fall in love at first sight. Unlike his father, Romeo is a kind and humble man who is opposed to his father's cruelty and shares many ideals with Juliet. Unfortunately for them, Capulet loyalists are planning a rebellion to overthrow House Montague while Leontes is obsessed with destroying the threat of House Capulet permanently. As these star-crossed lovers face many challenges and adventures together which will strengthen their love, an ancient secret hidden within Neo Verona is slowly revealed. Alright, animation, time to rip you a new one. I mean, it’s Gonzo, there’s gonna be a good amount of screw ups........ Oh wow....... *looks at the sky and whispers* Thank you! Alright, jokes aside, Gonzo really REALLY made this series look amazing! With Gonzo, there are series that have minimal flaws in it’s animation (Yay Last Exile and Gankutsuou! ), and then there are those series that are just plain sloppy (Thanks NHK.....). Romeo X Juliet is the exception to both these kinds of series because it is completely flawless! Animation, character design, and even the music is perfect for the series! The character design, especially, kind of reminds me of your typical Disney movie (if you can actually believe that one). Shakespeare would be rolling over his grave if he saw all this! Now with a story like Romeo and Juliet, you expect the same kind of characters as in the play. Not the case here..... SO not the case...... Because of the situation in the story itself, the characters respond in the way they should in that situation. The biggest 180 when it comes to character development is Juliet. In the original play, she was fair and reserved. What the anime decided to go and do was make her into a complete badass character! She is one of the few strong lead female characters in any recent anime, from what I can think of. Not only does she have to deal with the truth and duty of her real identity, but she also is the people’s hero known as The Red Whirlwind. Takes a very strong female character in order to achieve this feet, and she is my favorite of this series. As for Romeo, he’s also a 180 character, but in a more gentle, naive kind of way. However, he does become stronger throughout the series. He not only defies what his birth right is suppose to deem him, but even completely turns on his father and assists Juliet in taking him down. In other words, there’s a complete role reversal between Romeo and Juliet in this version. The rest of the characters have minimal development, but it’s justifiable. The story is about our two young lovers, that’s it. The rest of the characters are there for support. However, I will say, the supporting cast is a lot more interesting then the original. 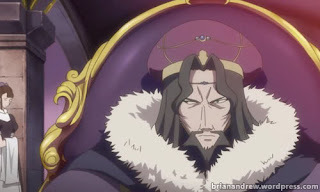 Characters go crazy, are evil tyrants, and are always seeking revenge (What is it with anime and vengeance?). Downside to this is there are WAY too many supporting characters in this series, taking it away from the main leads. The English Dub FUNimation put together is fantastic! 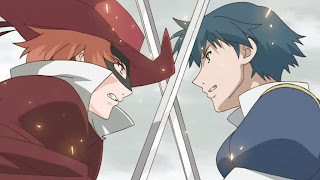 Brina Palencia (Spice and Wolf, Nabari no Ou) and Chris Burnett (Nabari no Ou, Hell Girl) as our two leading lovers are a perfect casting choice! Palencia especially because she not only has to play a female, but she had to create another voice for Juliet’s aliases Odin and The Red Whirlwind. Together, they make their love innocent like in the play, but not as naive as the play portrays them to be. As for our villain, Lord Montague, Sean Hennigan (One Piece, Baccano!) makes the cruel tyrant come alive with every word he says. The rest of the cast is so well done that it would take a long time for me to get through everyone, so I’m gonna make this short. A few people I’m glad to see resurface in this series are Maxey Whitehead (Baccano!) as Antonio, Joel McDonald (Nabari no Ou) as Vittorio, and Carrie Savage (Gankutsuou) as Hermione. 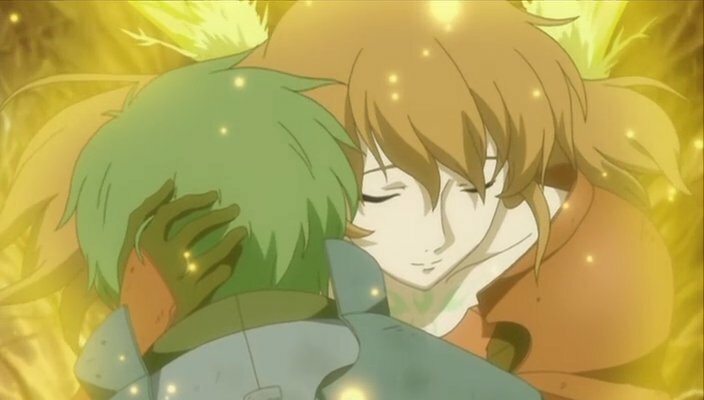 Mainly because Whitehead and McDonald were awesome in Baccano! and I was excited to see them in more things. 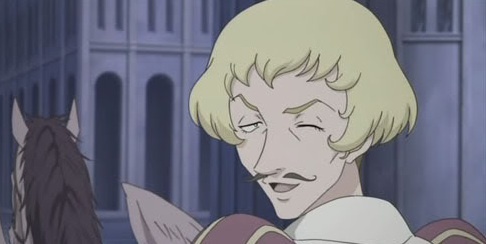 And if you’re wondering about William de Farnase (AKA Shakespeare the anime version), J. Michael Tatum (Spice and Wolf) took on this task and brought to life the famous playwright (And there goes Shakespeare in his grave again....). Other voice actors for the series include: Colleen Clinkenbeard, R. Bruce Elliott, Eric Vale, Robert McCollum, Mike McFarland, Larissa Wolcott, Sean Michael Teague, and Christopher Bevins. Now, there’s a reason why I only decide to review the English Dub and not even bother with the Japanese version. What FUNimation decided to do, unlike Gonzo, was take the extra time and effort and use the same dialect as the original play. The literary device the series decides to use is called Iambic Pentameter, which is defined as a common meter in poetry consisting of an unrhymed line with five feet or accents, each foot containing an unaccented syllable and an accented syllable. This gives more of a feel of a Shakespeare play rather than just coming up with completely new dialogue. Granted, it does drop the ball (a lot) and add some newer phrases, but the series doesn’t need to be punished for that. It takes lines directly from the play and are used in the dub. I think it clearly makes up for it. 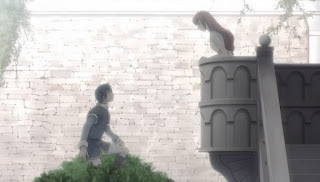 By the end of the production, Romeo X Juliet is a remake of a classic story with many twists. From the new story, to the setting, and even the characters the series takes Shakespeare’s classic ideas of star crossed love and puts it on steroids! If you’re a theatre student, like myself, and have read any Shakespeare, this is a must see. If you’ve never read any Shakespeare (hard to find someone who doesn’t know what the hell Romeo and Juliet is now a days) and watch this, don’t read the play after that cause you’ll be mad it’s not as epic. Either way, go and watch it! And if you are looking for something else to bide your time with then look no further than another Gonzo/novel adaptation Gankutusuou: The Count of Monte Cristo. Very stylized and very faithful to it's original story, it's a must see! What is that brings these things to final end? Tis ultimately, love, that wins the day. For love, indeed, doth old wounds warmly tend. And so, dear friends, with that we close our play. Did you know that you can create short urls with Shortest and make money for every click on your short links.